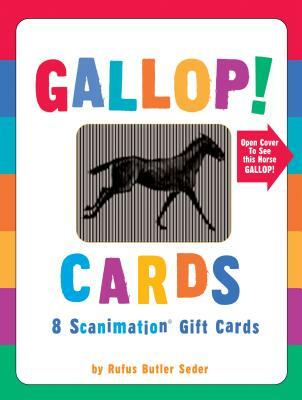 The pleasure of greeting cards, the pleasure of Scanimation®— the pleasure of Gallop! for all ages. Gallop! Cards are the gift that keeps on giving, whether you make the whole package a gift or send just one. Interestingly, the inventor, Rufus Butler Seder, first introduced his Scanimation technology in a greeting card format. Gallop!, the runaway #1 bestseller, brought Scanimation to the world at large, and now his greeting cards are going national, too. The 5" X 7" cards are suitable for giving to kids and adults for all sorts of occasions. They are guaranteed to delight and astonish any person lucky enough to receive one. The set of eight notecards (two each of four designs) and envelopes is packaged in a box with its own Scanimation image on the cover. Two sticker sheets are included with the cards. Rufus Butler Seder is an optical genius whose first significant invention was Lifetiles, glass-walled murals that appear to come to life when the viewer walks by. He’s installed them at the Smithsonian, SeaWorld, Union Station, and other museums, aquariums, train stations, and ocean liners around the world. Next came Scanimation, and his company EyeThink, Inc., a business that produces a line of toys and gifts using technologies he’s invented. Mr. Seder lives in Boston, Massachusetts.